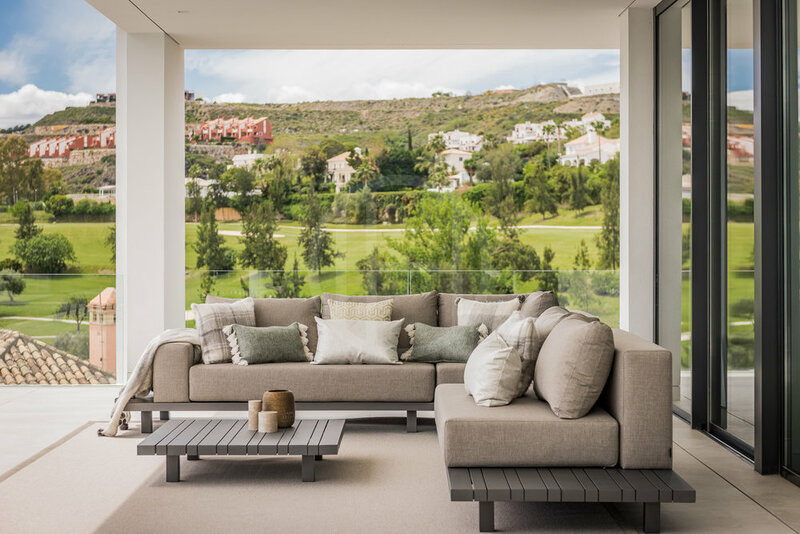 The villa has a built size of 577 m2 plus large basement of 265 m2 with a huge open plan space, on a plot of 1.360 m2. Entering the plot through an automatic sliding door and a driveway down to the garage and the entrance level with landscaped rooftops. Entering the villa form this level offers a hallway with separate entrance to the garage, the elevator, staircase and huge rooftop terrace. 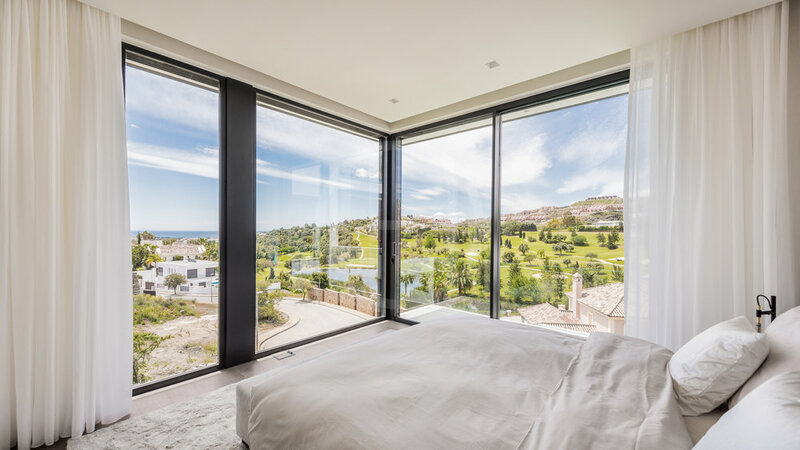 This area contains big windows with views on the golf course and Mediterranean. 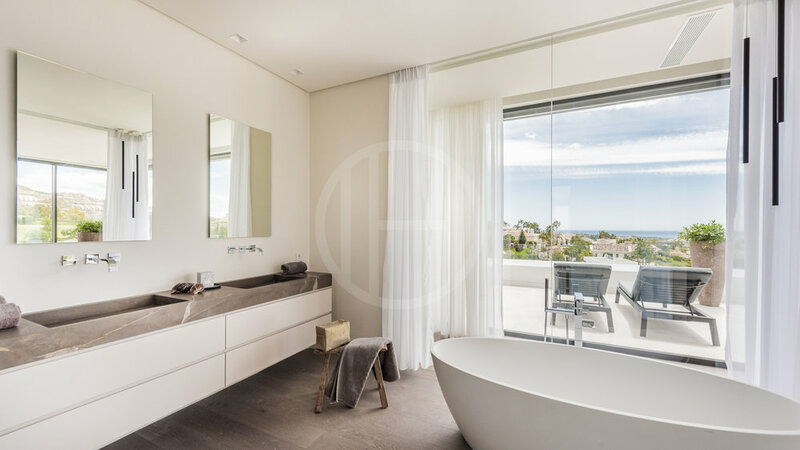 The first floor houses 4 bedrooms with bathrooms en suite, including the master suite, all with access to terraces from where the spectacular views can be enjoyed. The master wing also has a walk-in-closet with lots of space and LED lighting. Furthermore there is a space, accessible from the hallway, which can be used for housing a gym, wellness or home cinema. 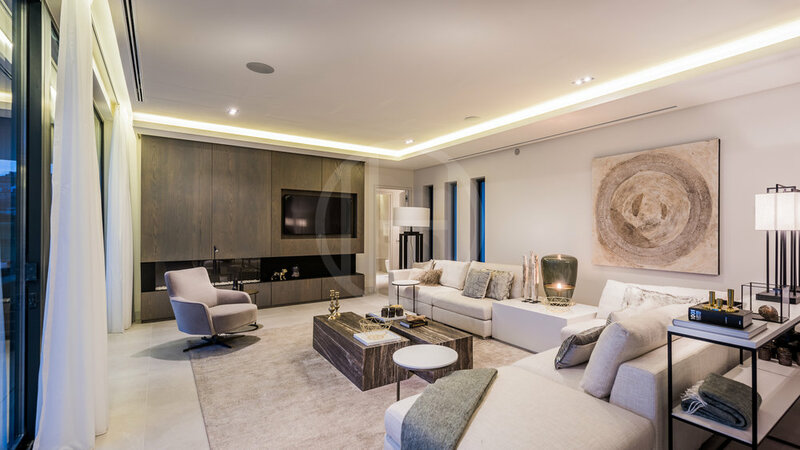 The ground floor level consists of the living area, an open plan kitchen and dining area. Hidden behind the kitchen cabinets you will find the utility room. The kitchen area is completed with a spectacular glass covered bodega. The dining area offers an integrated closet wall, with space for a television and finished with a panoramic gas fire place. The living also contains a cabinet wall with wooden finishing, a television and gas fire place. The impressive double high ceiling, it's windows from floor to ceiling and the glass front, all enhance the feeling of space and light. There is an extra room on the West side with separate bathroom which can be used as an office or bedroom for example. 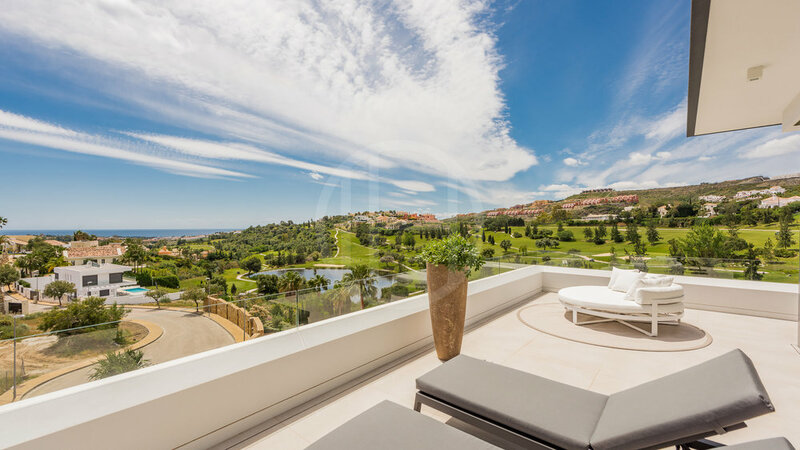 Large covered and open-air terraces complement outdoor living, all overlooking the amazing infinity pool and views on golf, mountains and Mediterranean. 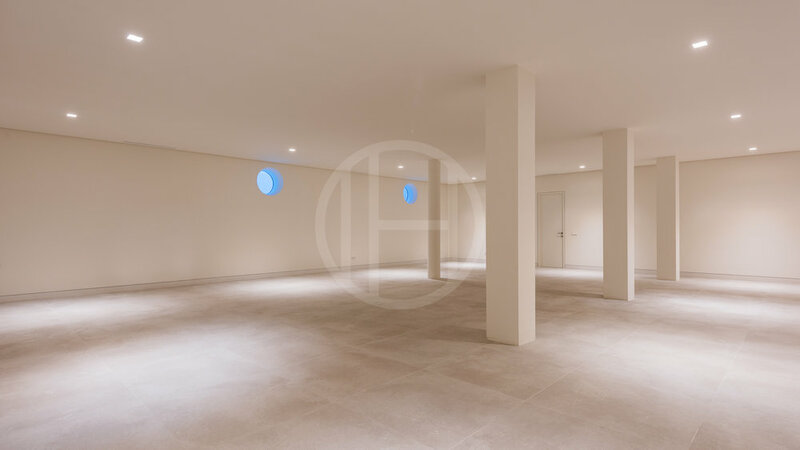 The large basement covers a total built space of 265 m2 with technical rooms, laundry room and extra bathroom. 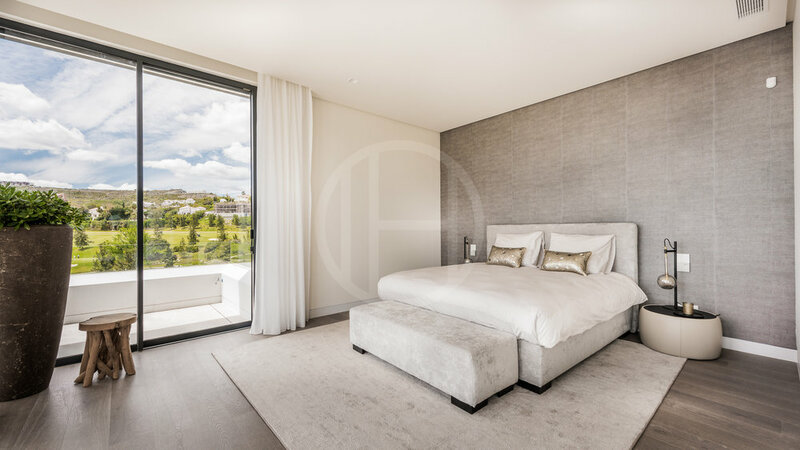 Furthermore a large open plan space (170 m2) for gym, wellness, home cinema or extra bedrooms. The technical room can be entered separately from outside.